To be perfectly honest, this was not the original plan for this month. I spent quite a lot of time early this month working on something totally new and different. Then I got sick for three weeks and could barely think about anything creative, so I could either throw the last 30% of that project together at the last minute and end up with something I'm not happy with, or I could bail out and do something else this month. 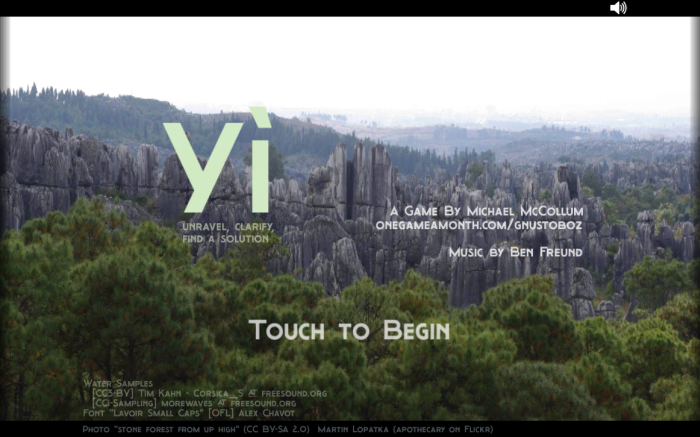 So here we have my first port for 1GAM - Yì for Android, a mobile port of my September 2013 project. 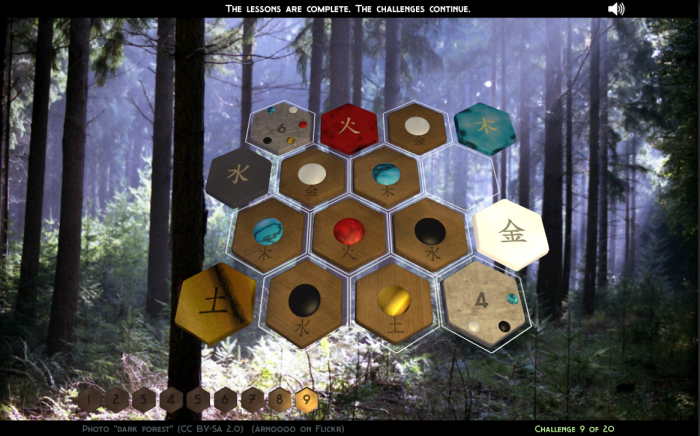 If you're reading this much, you really should consider heading over to the Yì project page for the full details. It's one of the more thorough post-mortems I've done of a design philosophy and process on any of my 1GAM projects. Now admittedly, porting a Unity project to Android isn't exactly heavy lifting, but mobile development is something I've never really jumped into, so there was some prep work to do, and my test project could be a proper Android version of one of my more polished 1GAM projects. I just upgraded to a Moto G this month, so part of this project was just to get a current Android development environment set up, get the phone set up for build deployment and debugging, and then work on the actual porting. I improved the touch input handling in several places, added a one-touch on-screen sound toggle, rearranged and resized some text elements for better visibility on small screens, and replaced several shaders with more stripped-down mobile-friendly options. I'm still pretty happy with how Yì turned out, and it's nice to see it on the new phone in such good shape. I suspect this will not be the last time I spend some time with this game.